Homefield is a development of 16 new homes in the village of West Alvington, just outside of Kingsbridge in South Devon. The scheme comprises 8 open market houses and 8 affordable homes with a mix of shared equity and rental units. The sloping site presented some challenges, and so a number of the houses feature a clever split level design. The design of the houses responded to the local vernacular, with rendered walls and traditional casement windows sat under pitched slate roofs. The buildings were arranged and orientated to suit the sloping site, maximise natural light and afford views down the valley. The orientation of the buildings also creates an interesting street scene and ensures a degree of passive surveillance over all public areas within the development. Following the granting of planning permission, we were retained by the contractors to produce detailed building regulations drawings as part of the Design and Build project team. The houses were constructed using prefabricated timer frames for speed on site and high thermal performance. A rendered block leaf was constructed around the timber frames to provide a robust external skin, and this design decision also suited the sloping site levels. 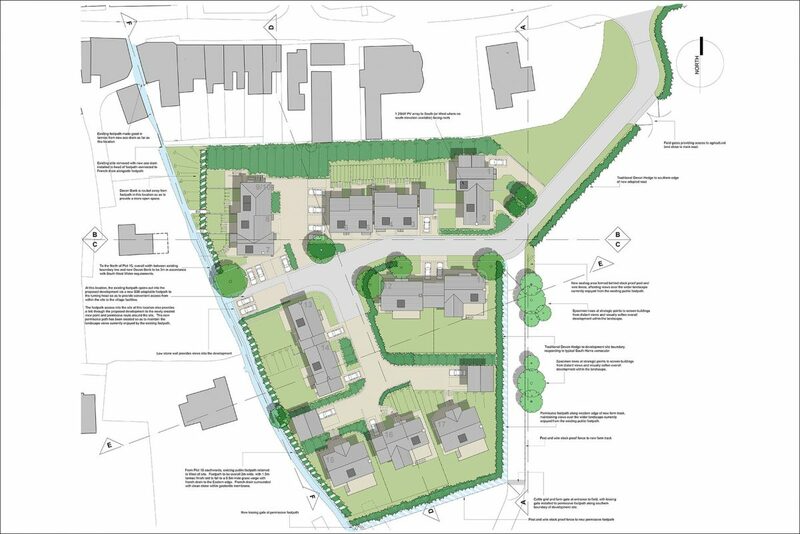 Having secured the planning permission for the site for the original land owner, we were pleased to be able to stay on as part of the construction team and deliver the project.